I didn't get to do much in the way of Yard/Garage/Tag/Estate sales this week - although I did hit one sale held by one of those official Estate Sale firms. It was actually near the house and I managed to score a few items. While I was walking up to the house someone was walking out with a nice 60-70 pound anvil - I asked "How much" and his reply was $40 - a good deal for him so I was hopeful in finding a few things. 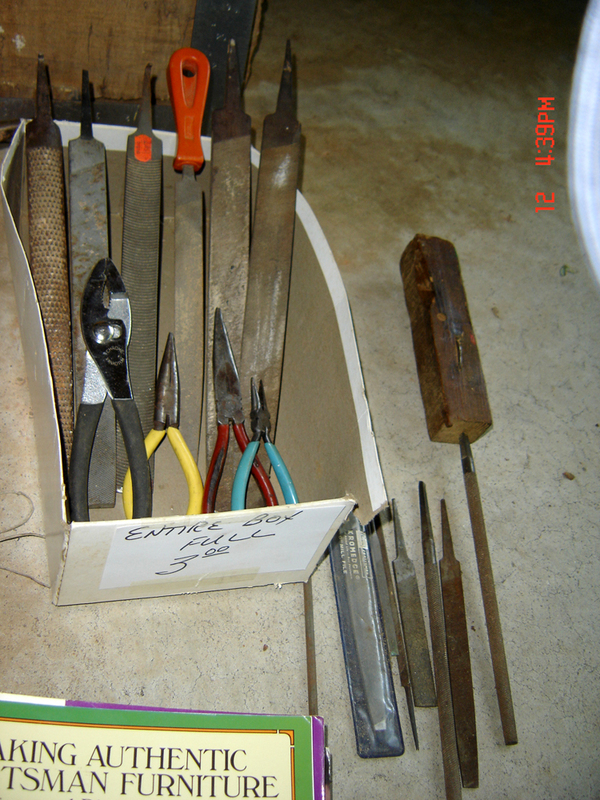 When I got into the basement all the hand planes and many of the other hand tools were gone. I picked up a few misc. items and settled on a box of old files - at $3 it was worth it just for the Vixen that was in there (my favorite file type). 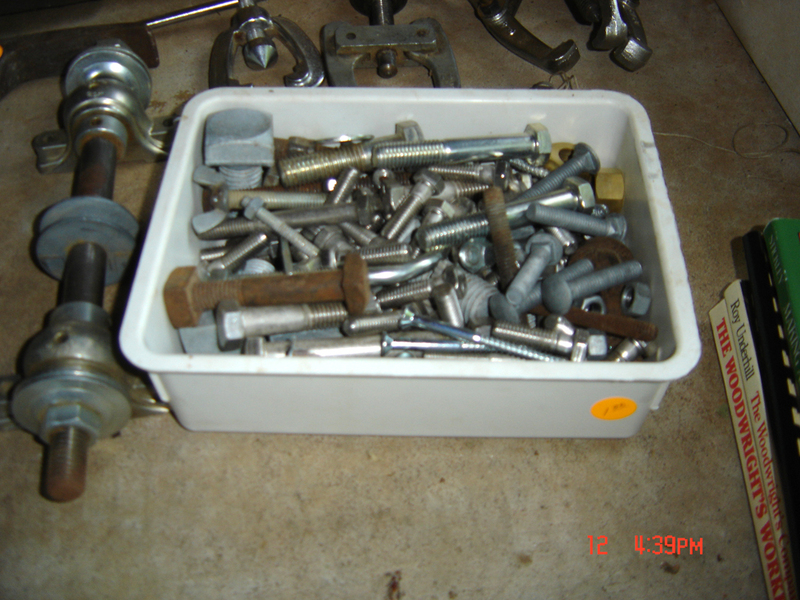 I also found a Stanley framing square for $2, a container of large bolts for $1, a few hammer handles and a mason's hammer (all super cheap). I then found some gear pullers (all Taiwan-made but of reasonably good quality) and a tool arbor with bearings and pulley (never know when you need one). 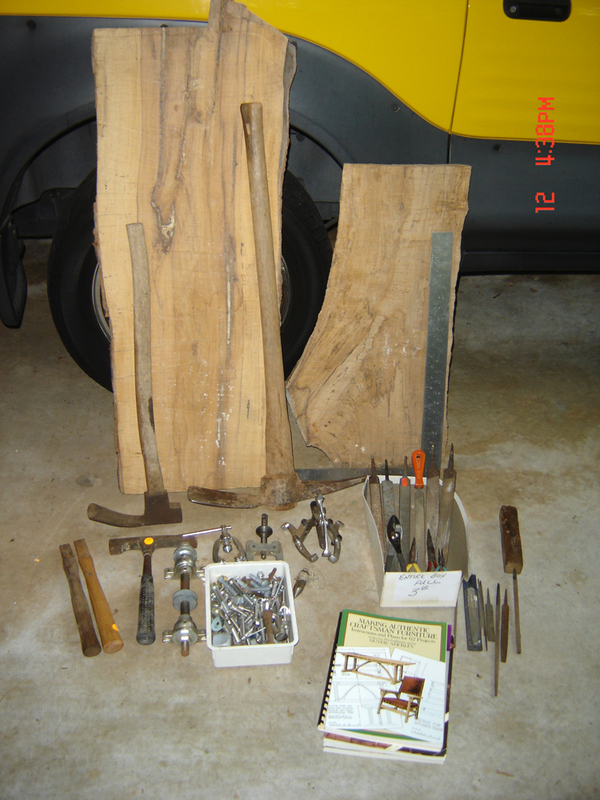 I then spotted the adz and axe and the two spalted maple slabs (3-4 inches thick and not punky) - I paid the most for the adz at $15 but the US-made pick was only $5 (mine disappeared so this was a timely purchase). I also found a heavy sledgehammer (not pictured) also US-made for $5. 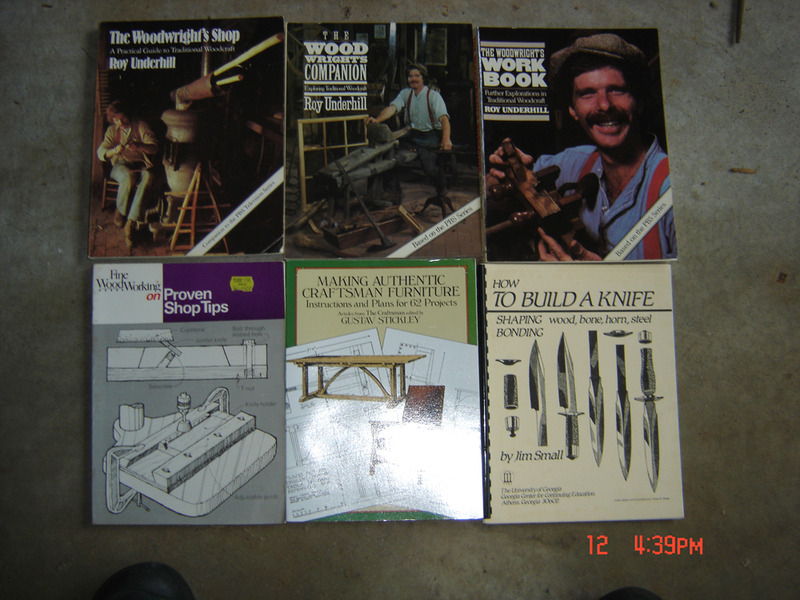 I lugged those out to the truck and then went back to look for anything else and found some woodworking books upstairs. I've long wanted a set of St. Roy's books and here was all three for a buck each - real score for me. I picked up the early Fine Woodworking tips book since it was all illustrations, the Gustav Stickley reprint (I have the original version but now I don't have to worry about trashing it) and an interesting booklet on knife making - seems the PO took a continuing ed class regarding same. There are some interesting ideas in it so it'll be fun exploring a few techniques. One other item not pictured was a small book on limericks illustrated by Edward Gorey - some Scholastic publication I've never seen - that went to my wife. That's about it for now. We had our Neighborhood Yard Sale this same weekend so my Saturday was shot - wasn't able to make the GWA meeting either (shop tours so it was a double whammy as I really enjoy touring other member's shops). I did manage to sell a lot of things no longer wanted and even made a some money so my time was well spent. Man I love looking trough estate sales, there's always something special, it may not be special to everyone, but there's always something special. Vixen files, I'll have to keep an eye out for some.